Nutritionally rich turnip greens can be eaten, as well as the root of this vegetable. 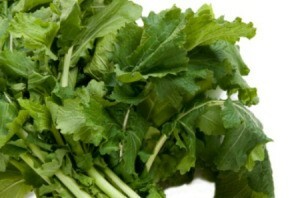 This page contains recipes using turnip greens. In deep skillet or heavy pot, brown bacon until crisp, then add greens and water. Cover and cook over low heat, stirring occasionally, about 30 minutes. Add salt and serve. I wanted to make a spinach frittata recipe, and thought that I had frozen spinach in the freezer. The closest thing I had was a can of seasoned turnip greens. I strained the greens well, and patted them between two kitchen towels to remove almost all of the moisture, then used them in place of the spinach. It was just as good, if not better, than it would have been with the spinach. Just substitute the greens in your favorite spinach frittata recipe. Source: Just came from desperation. This is a 'put your hand on your tummy and rub to show it's yummy' recipe. Heat a large pot over high heat until hot. Add the olive oil. Add the garlic and cook for a few seconds until it is golden.